Toyota isn’t just one of the most popular automobile manufacturers in the world, it’s also one of the largest employers in Southern Indiana. With a winning mixture of performance, dependability, and regional pedigree, it’s no surprise that these Japanese automobiles are a local favorite. Toyotas command some of the highest resale values on the market, and for that reason many buyers rightfully view their Toyota as an investment. Keep your investment in perfect condition and you can be guaranteed a good chunk of change in return when you’re ready to upgrade. 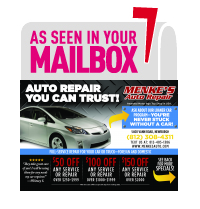 Whether you drive a Camry, Corolla, Highlander, Prius, Tacoma, 4Runner, or even a Lexus or Scion, Menke’s is ready to address all of your Toyota needs. The staff of technicians at Menke’s is specially trained to address any problem that a Toyota can encounter. Every Menke’s mechanic is ASE certified, and we’re continually training on the newest makes and models of Japanese cars. A locally made automobile deserves a special brand of attention. That’s why we make it our goal to keep every Toyota in factory fresh condition. With friends and family at the factory, we feel that our local Toyota drivers deserve something a little bit extra. At Menke’s, that means a special Southern Indiana brand of love and attention. Why were we named the country’s best garage over 165,000 other shops surveyed? It’s because we go the extra yard to make sure you have a good experience. Get a free loaner car, relax in the most comfortable waiting area you’ve ever seen, and see for yourself why we got our 2014 Facility of the Year and Best Dressed Shop Award. Our customers gave Menke’s the Angie’s Gold Award for Super Service. AAA inspectors named us the only AAA Approved Service and Repair shop in the area. What will you say about Menke’s?